Local Link Longford Westmeath has announced a new evening service on Route 865 Granard to Longford via Ballinalee. The announcement comes after the National Transport Authority (NTA) gave the green light to pilot an evening and night time service in rural areas across 19 counties. The pilot project gets underway this month and continues until the end of 2018. 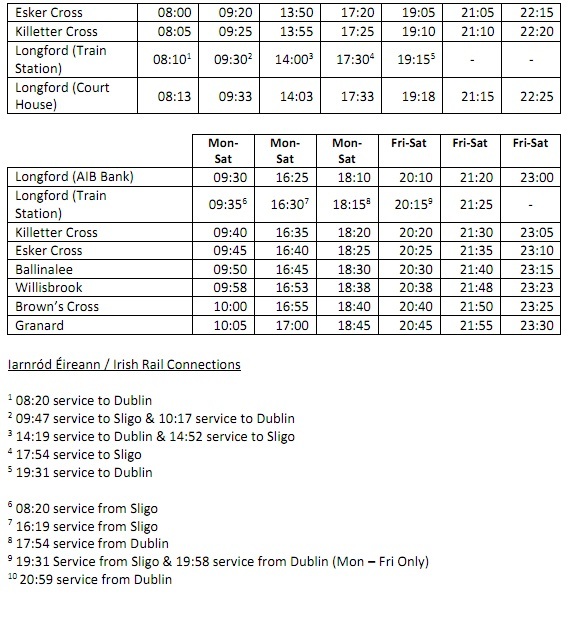 “The new Granard to Longford timetable will commence on Tuesday, June 5 and include 3 daily return services Monday to Thursday and six daily return services Friday and Saturday with connection to rail services in Longford Train Station,” said a spokesperson. Meanwhile, the vehicle used on this service is a low floored bus that is fully accessible. It is operated by Donnelly’s Pioneer Bus Service on behalf of Local Link. Local Link provides door-to-door and scheduled bus services in towns, villages and rural areas. The mission statement of the Rural Transport Programme is ‘to provide a quality nationwide community based public transport system in rural Ireland which responds to local needs’. Seventeen Transport Co-ordination Units (brand name Local Link), manage the delivery of rural transport services nationally on behalf of the National Transport Authority.